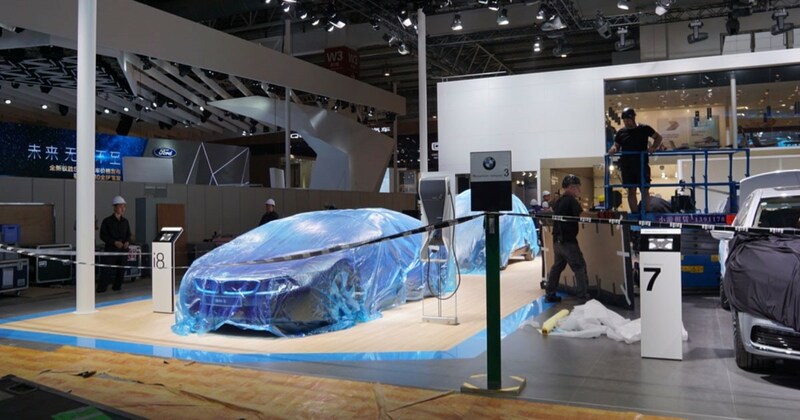 When you think of large Auto Shows in Europe or America, it is normal the construction works begins six weeks and more before the show starts. But in China everything is a little different. So everything began only two weeks ago. And when you walk along the floors, you might think, constructors needs to get some more time … But I assume: everything will be ready till Monday, when the show starts for journalists. The Auto China will start on Monday, April 25th. The press conference of BMW will begin at 10:40 AM Beijing-time, so this is 10:40 PM in Detroit on Sunday Evening. As soon as the press conference is over, I will bring you all the updates and photos – expect to see the BMW X1 Long-wheel-base and other debuts. The 2016 Auto China in Beijing is one of the largest Auto Shows in Asia. The BMW MOTOR SHOW BLOG will cover it for you.